Grandfather was a gardening freak. He spent most of his time in the garden after retirement. Various types of croton plants, roses and hibiscus looked happy and healthy under his care and supervision. He could not stand even one weed or a small tuft of grass on the neatly laid path around the pond, where he liked to walk in the mornings and evenings. A gardener was especially employed to keep the weeds out of sight. He had so much become a part of the garden, that the garden looked virtually incomplete on the days he took off. Grandfather had a vegetable patch and many fruit trees in our garden. His love for the garden had rubbed off on us too. So we decided to grow our own vegetable garden during our Dasara holidays. Since grand father was too possessive to lend out his gardening tools which he guarded safely in a very huge iron box, my youngest brother successfully pestered father into buying a small gardening set from the Dasara exhibition. We also picked up a few seeds packets from the flower show. Grandfather graciously lent his gardener for digging and preparing the soil. We were highly excited on the day we sowed the seeds. We took turns to water our vegetable patch, after we returned from school, without even caring to change out of our school uniforms. There was jubilation when the first shoots showed up, and later when the plants had flowered. 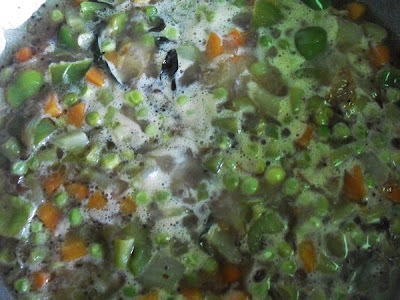 We harvested our vegetables on a Sunday morning, and mother promised to cook the same for lunch. Beans, tomatoes, brinjal and spinach were glowing fresh as mother washed them under the tap. It so happened that our old Granduncle landed at our home on the same day. 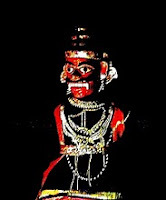 The moment he arrived, he announced a list of food items and vegetables he would not eat, either due to the vows he had made to various deities or due to his personal whims. Mother had prepared a delicious Vangi Bath and she had to skip Granduncle’s leaf while serving, as he would not eat brinjal. All of us enjoyed the garden fresh vegetables and the aromatic Vangi Bath mother had prepared with great expertise. Granduncle saw us smacking our lips, and when Grandfather and father demanded for more helpings, Granduncle could not control his curiosity. Grandfather encouraged him to taste a spoon of the delicacy, he reluctantly allowed mother to server him a ¼ spoon only. Later on he requested a large serving of Vangi Bath and relished it sheepishly, while the four of us hid our grins. Granduncle had to admit, that brinjal was after all not that bad a vegetable when mother prepared it and he even decided to score off the vegetable from the ‘not-to-make’ list whenever he visited us. Here is mother's recipe for a lip smacking Vangi Bath. 3. Next add cinnamon, cardamom and clove and fry. 4. Next add the dals and coriander seeds and roast till golden in colour. 5. Add red chillies and roast for few more seconds until chillies are crisp. 6. Allow to cool and then dry grind to a coarse powder. 7. Add copra and grind for few more seconds. This powder can be stored in an air tight container from a week to 10 days. The powder looses aroma on prolonged storage. 1.Cook rice in just enough water. Do not over cook. Cool the rice. 2. Cut brinjal into 1'’ strips, and keep immersed in cold water to prevent discoloration. 4. Drain the brinjal and add to the oil, along with curry leaves, turmeric and salt and stir. 5. Cover and cook on low fire, stirring occasionally. Brinjals cook very fast, so take care not to overcook them. The pieces should retain their shape. 6. Add the prepared masala powder and blend with the vegetable. 7. Squeeze in the line juice and remove from heat. 8. Loosen the rice until the grains are separated. 9. Add the vegetable to the rice and mix well until the spice coats the rice. 10. Serve hot, topped with fried cashew nuts. Raita, curd, avail, papad and chips go well with Vangi Bath. The choice is yours! The morning breeze slapped the pleasant fragrance of the mango flowers on my face, as I stood in my balcony on the third floor. 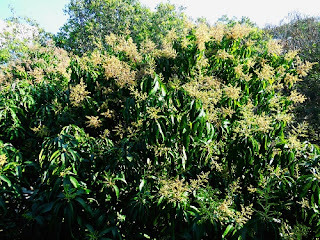 I could behold the tree top which was thickly covered with whitish green mango flowers, reminding me of a bride’s veil.The bees hovering over the flowers, the butterflies fluttering around and the birds which flew in and out of the tree cover, were all celebrating Spring. I could view a koel which landed on a branch, and it started to hum a sweet tune. The age old story goes that the mute koel finds its voice only after eating the mango flowers. It could have been the imaginative expression of the poets of yore, but it is true that the bird is heard during the mango season. I remember the time when we had a great time mimicking the stupid koels. The five of us – the four siblings and the koel – would go on and on and on with the kuhooo, kuhooo,kuhooo,until the song reached a high tempo as the decibels increased. We alternated with the koel one by one, taking turns, for a long time, until finally the pleasing song ended up with the hysteric shrieks of the duped koel. We were very patient when it came to waiting for the mango flowers to turn into small mangoes. But we were definitely not willing to wait until it reached its full growth. We ganged up under the tree and pelted stones at the baby mangoes which dropped down unable to withstand our attack. While two of us picked up the tiny mangoes, the other two sneaked into the kitchen to fetch chilly powder and salt. Mother was against us eating raw mangoes since she feared that it would trigger the onset of heat boils in our body. Hence we took refuge under the green canopy of the mango tree on our terrace, where the tree had extended its branches. We savored the bitter sour mangoes with chilly powder and salt, as we laughed about each others distorted facial expressions caused by the unique taste. There were occasions when we got caught and reprimanded or even beaten up for having broken the glass of a window or the glass dome on the lamp post which stood in the garden in our endeavor to secure the tiny mangoes. All the houses in our locality had many or at least one mango tree in their respective gardens. It had become a customary friendly gesture to exchange mangoes with pleasantries among the neighbors during the mango season. Thus our house was flooded with all varieties of mangoes, gifted as well as our own. Mother and grand mother had a hectic time sorting and segregating them for different purposes. Some were packed up in hay and stored away for ripening, some were used in different types of pickles. Some were diced, salted and sun dried for future use. Mother even made jam out of a few, which we enjoyed with our dosas and rotis. 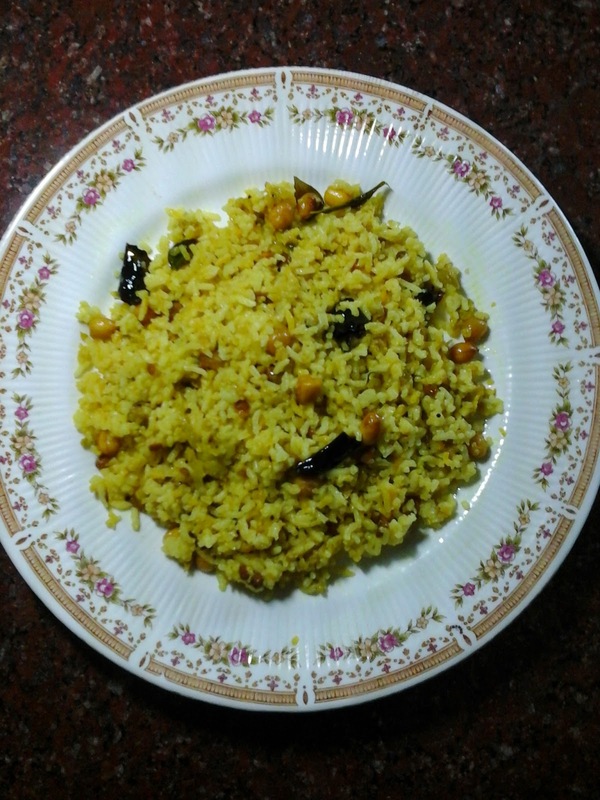 We were never tired of the mango rice which mother prepared every other day until the mango season lasted. Here is a simple method of preparing a delicious manga sadam / mango rice which I would like to share. 1. Cook rice with enough water and cool it. 4. Add black gram dal and Bengal gram dal and roast till golden in colour. 5. Add ground nuts and roast until it cracks. 6. Add red chillies and curry leaves and toss for one more minute. 7. Add the grated raw mango followed by turmeric powder and salt. 8. Cook on low flame until the oil separates and switch off the stove. 9. Break up the cooked and cooled rice and blend it with the cooked mango. 10. Enjoy the hot mango rice with raita or plain curd , papad or chips as you wish. It was heart rending to watch the great old Cannon Ball tree lying on the ground like a gentle giant. A shiver ran down my spine when I realized that the second in line to fall prey to the axe was the tall coconut tree which stood in the adjoining site. The Indian tradition reveres the coconut tree because it is 'Kalpa Vriksha' - the all giving tree. Coconut plays a prominent role in all festivities and rituals. No prayer or worship is complete without offering one or many coconuts to the deity invoked. People who built new houses incorporated the coconut trees in the building site - if there were any - in their building plans, so that they could retain them and nurture them. Other than quenching thirst and nourishing the body with its fruit and sweet water, every other part of the tree is useful in the manufacture of various essential articles. Whenever a coconut sapling was planted in our garden, mother fed the laborers and gave away gifts to ­them as a gesture of reverence and gratitude for having brought good luck to the house. Plucking the full-grown coconuts from the tall tree tops is a special fete carried out by skilled labourers.Father hired them when our trees were overburdened with the yield. We children were asked to stay away inside the house, till all the coconuts were 'dropped' down, lest we got bombarded by the coconut shower. The professional coconut tree climbers lassoed their feet with the two ends of a short rope. Hugging the tree with their hands and feet, they made an upward thrust to go up the tree, and in no time they scaled to the top. We stored all the coconuts in a large room in our backyard. The ripe ones were shorn out of the outer tough skin and the fibers, and the edible portion was left to dry. We stored a few for our cooking, and the major portion was sent to the oil mill. Home made coconut oil was used for massaging new borns.Grand mother extracted the milk from fresh coconut gratings. Then she boiled it in a huge pot until the oil separated from the scum. She filtered the pure oil in a clean muslin cloth and stored it in numerous bottles. She was very happy to give them away to families with new arrivals. Grand mother prepared mouth watering coconut burfies -candy made out of fresh coconut gratings and sugar in large quantities and stored them in air tight jars. It came in handy to entertain the children who accompanied our visitors. But with us around, the burfies would not even last for a day or two. Chutney powders, coconut chutneys, various other sweets and porridges made out of coconut , and spicy gravies were all part of our daily menu. One of the favorite dishes which mother contrived at the sight of an unexpected guest was coconut rice. Cooking rice in coconut milk and then seasoning it is a laborious task. But here is a very simple and easy method to turn out a tasty coconut delight. Step -1 : Wash and cook rice with just enough water so that it does not become mushy. Allow it to cool. Step -2: Break red chillies into small pieces. Crush papads into small bits. Step – 3: Heat cooking oil in a pan and add mustard seeds and allow it to splutter. Step – 4: Add black gram dal and Bengal gram dal . Roast until it turns golden in colour. Add ground nuts and let it crack. Step – 5 : Add the crushed papads and fry. 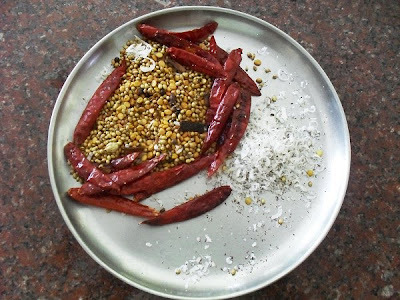 Step – 6 :Add in the red chillies and asafetida powder and fry for one more minute. Step – 7: Add the curry leaves. Step – 8: Add the fresh coconut gratings to the above seasoning and roast it in low fire until it turns into a golden colour and lets out a pleasant aroma. Step 9 : Add salt and sugar and toss for one more minute and turn off the flame. 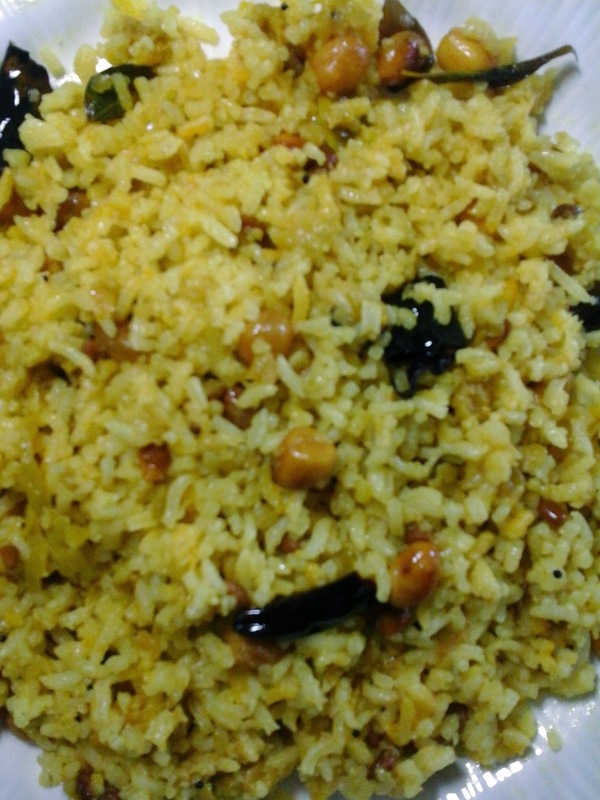 Step – 10 : Dot the cooked rice with a little ghee and break it until it separates. Then add it to the seasoning and blend well. Serve hot . It tastes good even without a side dish. The pre Sankranti(Pongal) days are very busy days for the farmers of India. That is the time when they reap what they had sown, when mother Earth showers her bounty on all those who toiled. Our ancestral house buzzed with the harvesting activities in preparation to welcome the Dhanya Lakshmi-THE GODDESS who blesses us with grains-that is the harvested paddy into the house. Grandfather supervised the preparation of the open courtyard, where the paddy had to be mounded up. The floor was well swept, sprinkled with water and a stone roller was rolled all over to level the ground. Then it was plastered with a mixture of cow dung and water. Cow dung is believed to be an insect repellent as well as a disinfectant. After it dried in the Sun the floor looked spick and span, and was ready to hold the paddy. The family owned lands were a twenty five miles away from our house.The farmers filled up the jute sacs with the paddy and loaded them on to the bullock carts and they would slowly saunter towards our house. Grandfather and father kept count as the farmers measured the paddy in marakkal-a measuring can used for the purpose- and heaped the measured paddy on the previously prepared floor. As the paddy hillock grew in size, we the mischievous foursome, as children, climbed the 'hill' and slid down again and again, in spite of knowing the consequences of our pranks. Later when we complained and squealed about the intolerable itching, mother gave us all a good bath interspersed with a few thrashes. Grandmother laid a wooden plank in the middle of the hall and decorated it with designs drawn with a mixture of rice flour and water (rangoli or kolam). A basketful of the new harvest was placed on the plank and she performed a small pooja-worship-to the Lakshmi with gratitude. A sheaf of paddy was hung in the doorway for the house sparrows to peck in as they flitted in and out of the house. At the end of the tiring but fulfilling exercise of the harvest, father fed the farmers with a delicious sambar rice (Rice, dal and vegetables cooked with spice) lovingly prepared with his own hands.With the help of his Man Friday, he made a stove by arranging three big stones under the huge jack fruit tree at the bottom of our garden. A huge brass cauldron filled with water was placed on the stove which was fed with dry fire wood. 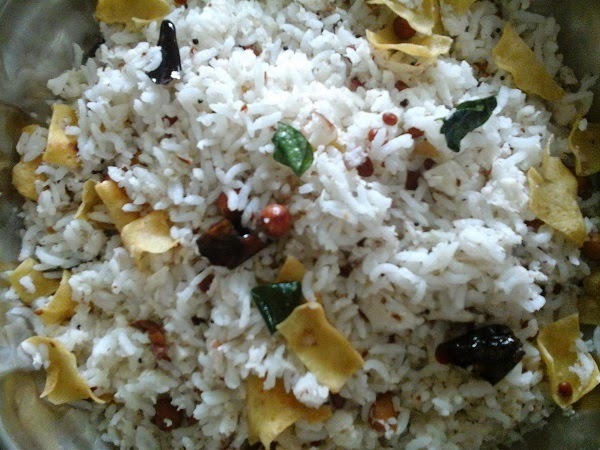 When the water boiled father added rice, dal and the vegetables meticulously cut by mother. Mother ground the spices in the big stone mortar in the kitchen and carried it to the garden in a big vessel. The aroma of the Sambar rice wafted in the gentle breeze and tickled our hunger pangs, as we played see-saw on the yokes of the bullock carts, while the bullocks rested in the shades of the trees chewing the cud contentedly. Father stirred in a big dollop of ghee into the Sambar rice and served it on big banana leaves freshly cut from the garden. 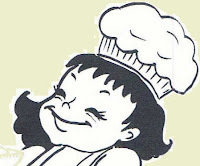 His face shone with great joy and contentment when the farmers hungrily gulped down the delicacy. 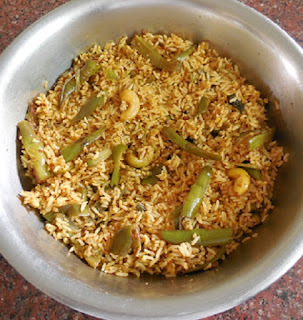 I have not tasted anything that resembled my father's Sambar rice in all my sixty years of life. 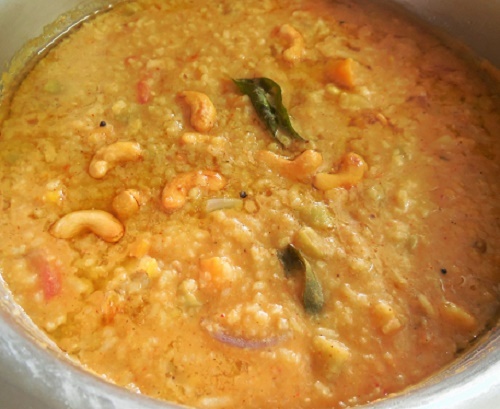 Here is a short and quick way to prepare the delicious Sambar rice (bisi-hot,bele-dal,bath-rice). Salt -2 teaspoons or to taste. 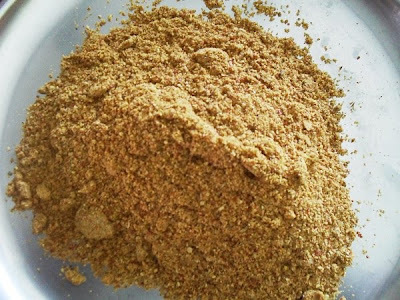 Asafoetida - 1 small piece or 1/4 tsp if it is powder. 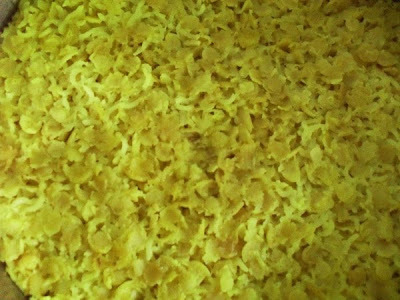 Dry coconut gratings -1 tbsp. Shelled peas -1 small cup. Cashew nuts or ground nuts - a little. Step I - Wash the rice and set it aside. Step II- Roast the tuvar dal in 1/4 tsp of ghee until you get a pleasant aroma. Step IV- Dice the onions and keep them aside. Step V-Skin, peel and dice all other vegetables and set them in another separator of the pressure cooker and place it on top of the rice dal vessel. Step VI - Fill a very small cup with water, drop in the tamarind ball, and place it in a corner of the vegetable separator. Step VII -Pressure cook as usual. Step I- Heat 1/4 tsp of cooking oil in a pan and roast asafoetida, cinnamon, cloves and cardamom . When you get a pleasant aroma, add the rest of the spices and roast until they become golden in colour. Step II- Dry grind the roasted ingredients into a fine powder. Add the dry coconut gratings and run the mixer for a few more minutes. Step I- Heat 1 tbsp of cooking oil in a pan. Add mustard seeds to it. When it splutters add curry leaves and diced onions. Step II- Open the cooker take out the tamarind and extract the juice. Step III - Pour the juice into the pan with 2 glasses of water. Step IV- Add salt and the cooked vegetables and bring it to a boil. Step V- Add the cooked rice and dal mixture and stir well. Add more water for a porridge like consistency. Step VI - Make a paste of the powdered spice and water. Add this paste to the rice and blend well. Step VII- Cook for two more minutes until the spice blends with the rice-dal vegetable mixture. Step VIII- Add 1 tbsp of ghee and immediately remove from the fire. Step IX- Roast the nuts in the remaining ghee and garnish. 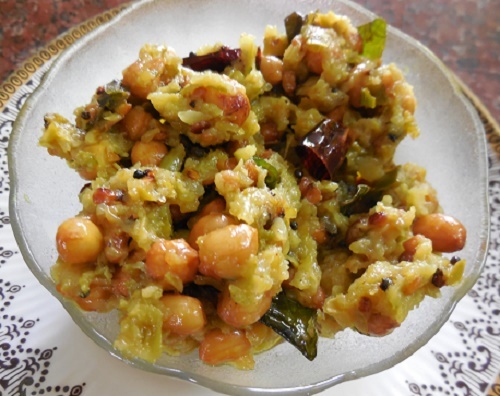 Enjoy the hot hot Bisi Bele Bath with Potato chips.